Preserving and restoring voices to Chicago & Beyond. We deliver the most advanced, professional medical care to those in need of treatment for voice disorders. Microlaryngscopy is surgery done on the voice box (larynx) with the aid of magnification via a relatively small diameter, rigid metal tube (laryngoscope) through which microlaryngeal instruments and/or lasers are inserted. 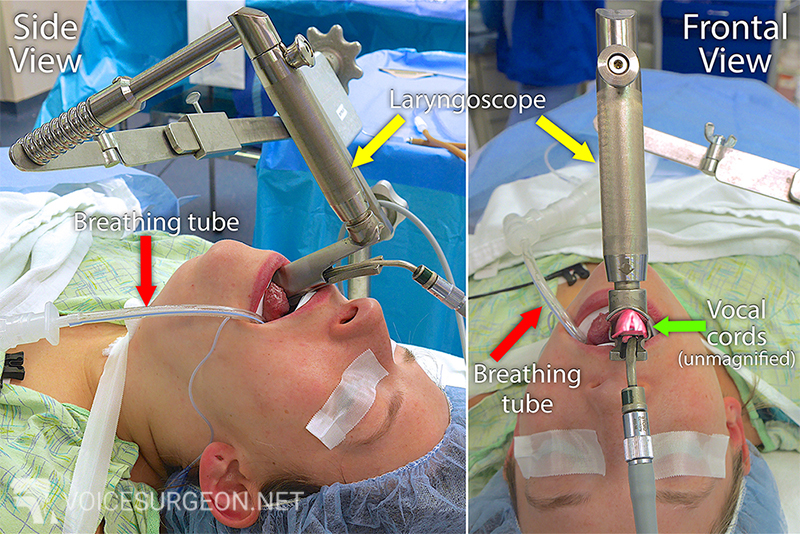 The laryngoscope is placed through a patient’s mouth (while he or she is under general anesthesia) and positioned to optimally view the larynx. It is typically then temporarily fixed into position in order to free the surgeon’s hands. The laryngoscope contains a light source, which illuminates the inner part of the laryngoscope, since room light is insufficient to view beyond the very outer portions of even the mouth. Additionally, the magnification device also provides its own, additional light source. The distal ends of several different laryngoscopes used in microlaryngeal surgery in adult patients. Note the various sizes and shapes, which are necessary to accommodate the variety of voice boxes (larynges) that exist across the anatomical spectrum. Additionally, patients have different capacities to have their larynges visualized during surgery due to a multitude of other anatomic factors, necessitating a wide variety of laryngoscopes to ensure the best visualization possible. An example of a laryngoscope that is used for direct visualization of the larynx in the operating room (direct laryngoscopy). The gray cable in the bottom left is attached to a light source to provide illumination within the laryngoscope. Views through the tubular part of the laryngoscope in Image A, with the end closest to the surgeon (proximal end) on the left and the end closest to the patient (distal end) on the right. Note the roughly triangular shape of the distal end of this particular laryngoscope, which is well suited to the triangular configuration of the vocal cords. Side and frontal views of a laryngoscope that has been inserted into a patient’s mouth under general anesthesia in the operating room. Red arrows indicate the breathing (endotracheal) tube, yellow arrows indicate the laryngoscope, and the green arrow shows the illuminated but unmagnified view of the vocal cords. An magnified view through the laryngoscope (see below) is necessary to provide maximal operative precision. A sample of the many instruments that are used for microlaryngeal surgerymicrolaryngoscopy. These include an array of delicate forceps, scissors, probes, and suctions. In general, each instrument is ~ 1 foot long, as seen with this curved forceps, which is used to precisely pick up vocal cord tissue. The extended length of each microinstrument allows it to be placed through the tubular portion of a laryngoscope. In general, microlaryngeal surgery is performed with two instruments at a time, one in each of the surgeon’s hands. To operate on small, high value tissue like the vocal cords with any degree of precision requires magnification. At present, microlaryngoscopy (and, in particular, surgery on the vocal cords) is generally performed with either the use of: (1) a binocular operating microscope, or (2) a magnified, rigid telescope. There are advantages and disadvantages to each technology, but the point is that laryngeal surgery is more precise with better magnification. A binocular operating microscope provides high-powered magnification when working through the laryngoscope. Notice that it is crucial for the surgeon’s arms and wrists to be supported, in order to maximally stabilize the long instruments when performing laryngeal surgery. View of a hemorrhagic polyp of the right vocal cord in the operating room, via an operating microscope at minimal and maximal zoom, with a 4 millimeter microlaryngeal probe placed beside the lesion for size calibration (see next image). Green arrow in left image indicates the location of the polyp seen in the right image. In many places on this website, you will see a right-angled, blunt microlaryngeal probe that is used intra-operatively to size vocal cord lesions. The vertical segment on this probe is 4 millimeters in length and is shown here next to a penny for a sense of scale.